In the City's press release they didn't mention that there will still be two gaps in the protected bike lanes between York and Yonge. One exception to the no stopping and separated design is a short segment between York Street and Yonge Street where two existing high demand "courier delivery zones" must be maintained to service the unique high volume truck delivery needs of First Canadian Place, Scotia Plaza and many business in the underground Path. This one section of street is already reduced to two lanes because of ongoing tower construction occupying the north side. Enhanced pavement markings will be provided to guide cyclists around these "courier delivery zones". If the cycle tracks are approved for permanent installation, alternative design solutions could be possible in this section in the future. I don't like the sound of "alternative design solutions". Interesting the City has no hesitation closing down lanes for numerous sections of Adelaide for multiple years for private construction projects but is so hesitant to do so when it involves the safety of the bicycle riding public. Why didn't courier delivery considerations prevent the closure of a lane on Adelaide for construction? This section of Adelaide is the scariest part of my morning commute, and is also the choke point for car traffic, making it difficult to merge into the next lane. I understand that this compromise may have been the only way this pilot project would, politically speaking, go forward, but it is a major disappointment to see the city once again, leaving gaps in otherwise protected infrastructure. I consider myself a pretty confident city cyclist, but this section literally scares me some days. 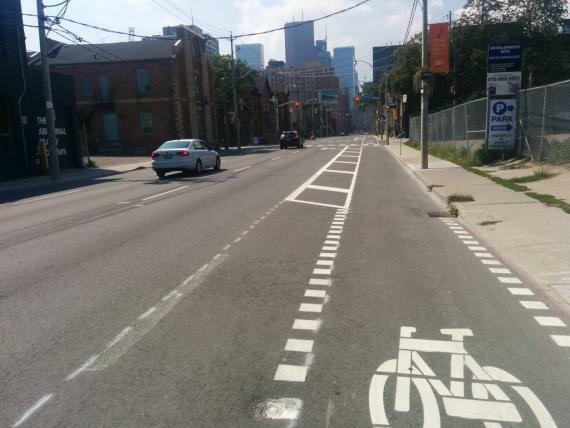 I can't see a new cyclist, or a parent with a child, using Adelaide between York and Yonge. The $150 fine signs are up as well on both Richmond and Adelaide. Interestingly, those are missing completely from the York - Yonge segment of Adelaide. Whether there will be a gap by the Scotia Plaza despite the fact that the left curb lane has recently been reopened remains to be seen. I don't see any reason why courier loading zones can't be accommodated to the left of the cycle tracks. It will make even easier for trucks to pull into the elevator since the turn radius would be wider. Of course, a dock supervisor will have to guide the driver to make sure they can only move in and out when there is a gap in the cycling traffic.